His studio is just a little bit whacky. Coloured lights flash and twirl. A tinny little voice set in squeaky-tinkly electronic music calls out “We are coming to Earth!” Tanning lamps shine from one wall. Folded car windscreen heat shields are stuck to another wall. I am offered a cup of tea and, from a large sugary box, a delicious little black liquorice mouse. My first impression – that does not last – is that the guy is….. well….. special! Tom Bogaert, it turns out, is a charismatic, widely-travelled human rights lawyer. He is impassioned by his creative projects that tend toward the intensely political. Some are statements that whisper insistently. Some scream. His work has been exhibited to no little press acclaim in New York, Beirut, Berlin, Gaza, Port au Prince, Jerusalem, Vienna, Dubai and Amman. He is now based in Geneva where he plans and prepares for future events. Meeting him is fun. 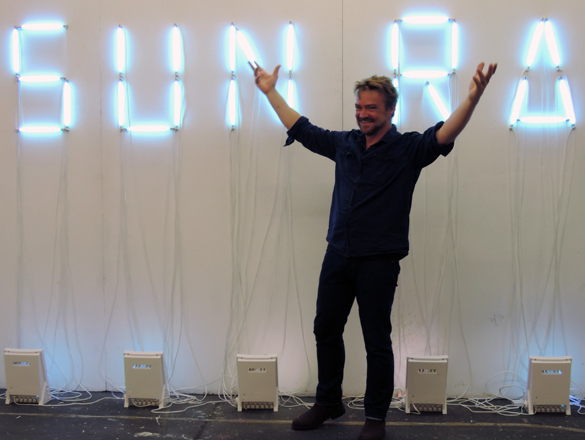 Tom Bogaert with his ““monument” 1 for Sun Ra,” 2013. 27 tanning lamps taken from 5 face tanners with mechanical timers. 300 x 200 x 30 cm. The Sun Ra in Egypt project focuses on a series of concerts performed in Egypt in 1971 by Sun Ra (real name: Herman Poole Blount), the legendary jazz pioneer and bandleader. Sun Ra was also a cosmic philosopher; he believed he came from Saturn. His mystic solar fascination – or obsession – began when, at the age of eight, he heard about the discovery of King Tutankhamen’s tomb. “The Broken Light Year” makes reference to astronmical distances, heat from the sun and the colours of Good King Tut’s sarcophagus. It tilts at Walter De Maria’s ‘The Broken Kilometer’ (1979). The Broken Light Year, by Tom Bogaert, 2013. 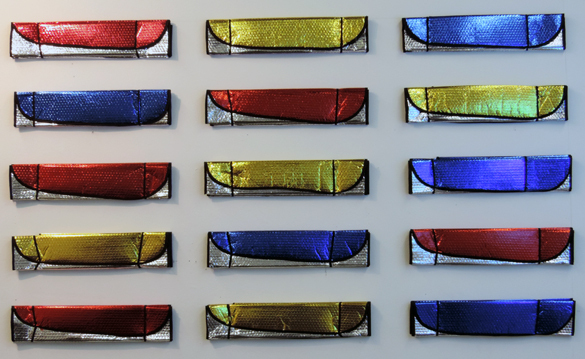 15 folded aluminum car windscreen heat shields in red, gold and blue. The parts of the Sun Ra in Egypt project that Tom shows me are just that: parts of a project. Although they stand for themselves, they serve also as research for what will culminate in an event in Cairo that will be part installation, part performance. Maybe this project is far from his political statements of recent years. Well… just try this, his most widely acclaimed work! “Colline au mille souris” (Hill of a thousand mice) is Tom’s angle on the 1994 Rwandan genocide. Using a huge pile of black, mouse-shaped sweets, he pulls together references to lush sub-Saharan hills, the infamous murder-inciting Radio Mille Collines, the sweet stench of thousands of rotting bodies and the Malthusian theory explaining that the awful event was the preordained result of the impersonal forces of poverty and over-population. 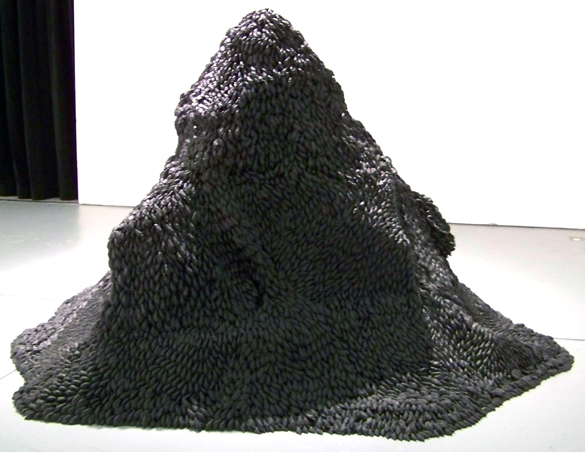 “Colline au mille souris III” by Tom Bogaert, 2008, Liquorice mice (lots of!) Image: Real Art Ways, Hartford, CT. The 20 year commemoration of the end of the Rwandan genocide will include a collective exhibition “Au Cœur des Ténèbres” (Heart of Darkness) at L’Espace Cheminée Nord opening on 4 July, 2014. It will include a new, bigger version of Colline au mille souris. The “What does it mean for me?” element of any post on Talking Beautiful Stuff is not so easy to answer. After an enjoyable hour in Tom’s company, I feel considerable admiration for the ambition and scope of his projects. They intrigue. They provoke. Together they represent an unusual creative force resonating with history however whacky or tragic that history mighty be. I am happy to have a brief glimpse of Tom’s world.